Happy Easter to all of you! 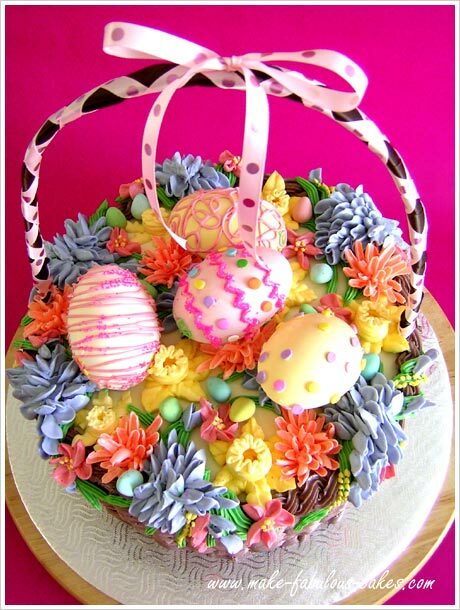 Here is a lovely Easter basket cake filled with flowers and Easter eggs. This cake can be the centerpiece to your Easter celebrations. 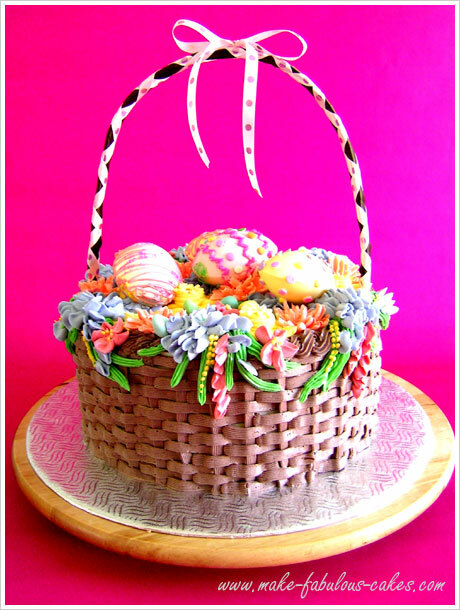 For this Easter basket cake, any round cake will do. Crumb coat the cake with buttercream and with a cake tip #47 pipe a basket-weave all around the cake. Make some buttercream flowers on top of the cake. You can check out this page on how to make the buttercream flowers. For the handle, I had planned to make it with fondant. Problem was, it didn't have enough time to dry. I really wanted this to be a basket cake with a handle, so I had to make a handle real quick. I took a long strip of cardboard and taped skewers on both ends. I then wrapped it with brown ribbon and added another decorative ribbon around it. Now, for the challenging part - making the chocolate eggs. If you really want to make your life simple and stress-free, just use the ready-made chocolate eggs. After my attempt to making these eggs, I promised to myself that I will use store bought ones next time. But if you are ambitious and need that extra stress in your life, you are more than welcome to make these chocolate Easter eggs. I am hardly an expert on this so I will not even attempt to make a tutorial about this. I used this tutorial on how to make your own molded eggs . I used white chocolate coating or candy melts and colored it with powdered coloring. The tricky part is attaching the two sides together. It is hard to make a nice, clean finish. If anyone has any tips on doing this, please do share!